We’ve now had Raven for two weeks. It sure doesn’t seem that long, although she’s settled in and feeling more adjusted to things. She’s finally housebroken, and will even whine at the door when she needs out (rather than us having to keep to a schedule). She’s learning commands; so far she knows sit, down, stay and shake a paw (I’m sure the latter will prove invaluable). And, I’ve been taking her on walks down the road. It was while out on one of these walks last week that I happened to spot some intriguing fungi on a tree along the side of the road. 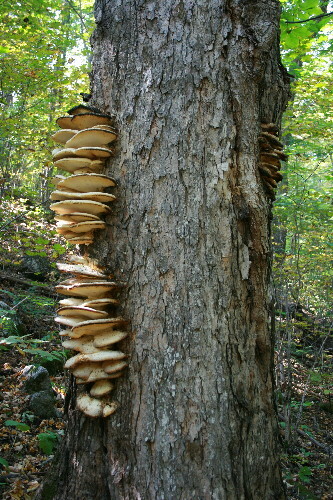 It looked like bracket fungi, stacked up horizontally in the crevice of the tree trunk. It occurred to me that I’d seen a small patch of this stuff on a tree further down the road, in the other direction, but hadn’t paid it much attention other than noting its presence. I returned this afternoon to get some photos of it, too. It was higher up than I remembered. It took me nearly a week to finally remember to grab my camera with all the other gear I was picking up as I took Raven out, and when I returned to the tree today to take its picture, all the fungi were gone, scraped off and dumped in a pile at the foot of the tree. I was a little surprised, but then, it was adorning a tree that was at the foot of someone’s driveway, so perhaps they found the stacked-pancake appearance unsightly. I also thought, perhaps they view fungi as the cause, not as the symptom, and scraped it off thinking they’d save the tree. Heheh, I thought, the fungus is there ’cause the tree’s already dead inside so scraping it off won’t help, but nice that they cared enough about their tree to worry about it. Well. The last laugh was on me, of course. I had spotted another tree sporting the same fungus deeper in the woods between that one and home, so I took Raven back and put her in her crate before returning and hiking the short distance into the forest to get photos. I examined the fungus closely, making sure I paid attention to the underside, taking several photos for the blog, then went back to identify it. I’d recently gone on a bit of a spending spree and ordered myself a dozen or so books online. Some of these were reference books for work I’m doing, but a few were guidebooks. 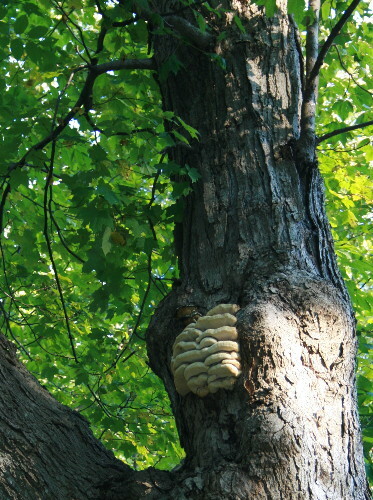 One was the Lone Pine Field Guide to Mushrooms of Northeast North America. Mom had taken this book out of the library way back in the winter to help us identify some of the winter fungi that were in the woods on their property, and I’d really liked it. It took me a while to get around to buying my own copy, but I’m glad to have it on my shelf. It’s to this book I now turned. Placing it into a group was easy. 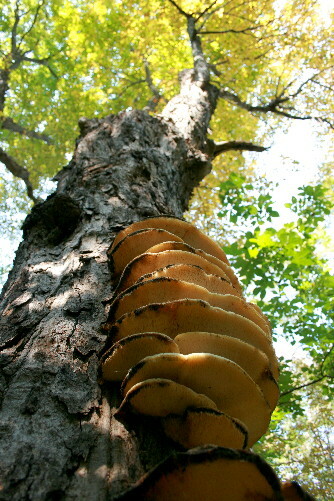 The first inclination would be to classify it as a bracket fungi, since it was growing on the side of the trunk in horizontal shelves, in the manner of a bracket fungi. However, the underside was covered in fine hairs or spines, giving it an almost furry, fuzzy texture. 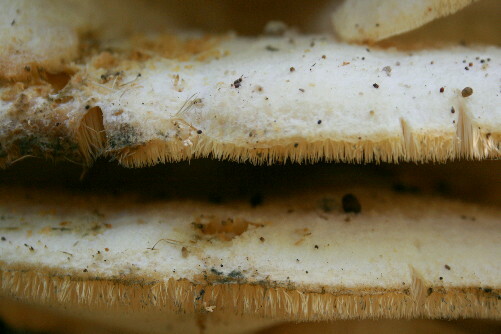 This placed it in the Tooth Fungi group, the teeth of which offer an increased surface area from which to produce and distribute spores. There were only a few pages of tooth fungi to browse through, and sure enough, there at the end was mine: Climacodon septentrionale, commonly known as Shelving Tooth, or Northern Tooth fungus, a widespread and common species. Although two of the three sets of fruiting bodies I’d found were at or below eye level, it’s apparently more frequently seen higher up on the trunk. And the last laugh? 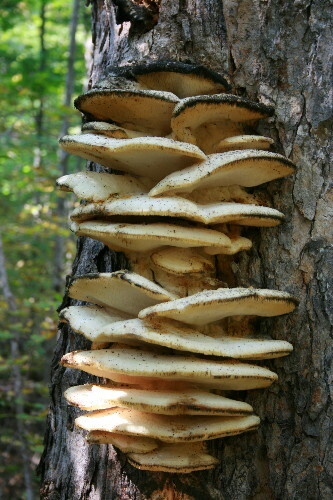 Well, it turns out that Shelving Tooth grows on the trunks of living hardwood trees, particularly maples, where it invades wounds and causes heartwood rot. 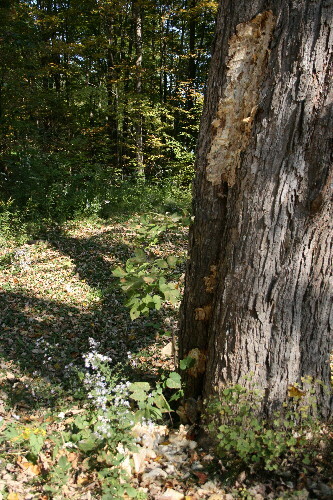 Sometimes the rot can be severe enough to weaken the tree to the point that the trunk will snap in strong winds. I’m not sure if scraping off the fruiting bodies will be enough to stave off heartwood rot in that big maple, but it sure doesn’t hurt to try. Nice article. I just saw a fine example of Shelving Tooth myself.